THE annual convoy of trucks is an event held to remember those in the trucking community who have lost their lives on the road. 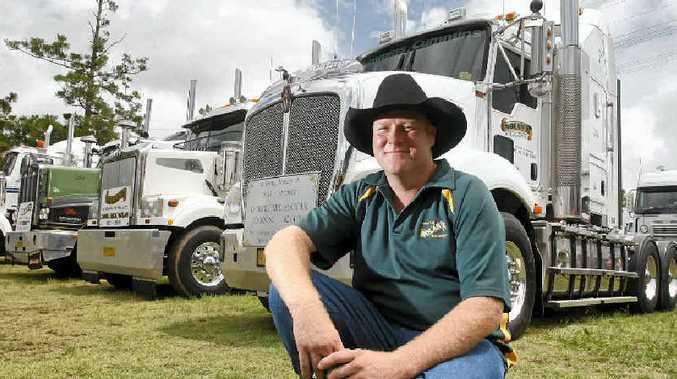 Two convoys converged on the Gatton Showgrounds on February 25, with trucks and utes making their way from Toowoomba and Amberley to attend the annual event. Despite a wet day drivers still took part in both the convoy and the event at Gatton. Many of the trucks taking part in the convoys from Toowoomba and Brisbane were carrying flags and banners, remembering their mates who had died in crashes on the highway. Lights on the Hill committee president Gary Simpson said despite the weather the day was a huge success. "It was fabulous considering the weather," he said. "Even though it was raining we had 300 trucks in the convoy which is a great number. "We drive through the rain, a little shower wasn't going to stop us." Mr Simpson, whose son drove his truck from Amberley to Gatton, said the events following the convoy were fantastic. "The atmosphere was just electric," he said. "Everyone there was so dedicated to it and to the cause." Mr Simpson said his committee and the volunteers on the day had done an amazing job. "The Lights on the Hill committee are a fantastic team and a just a really great bunch of people," he said. "I'm really proud of them and all the hard work they put in to make it such a great day. "All the people involved and especially the volunteers helping throughout the day were just great. "I'm really pleased with how the day turned out and really proud of everyone involved, not to mention the drivers who took part in the convoys and the day." The Lights on the Hill committee will not be resting on their laurels after the convoy with preparations already under way for the annual memorial day to be held in October. "The memorial day is always a bit of a sad day, there's no convoy and it doesn't have the atmosphere we had this weekend," Mr Simpson said. The Lights on the Hill memorial day will be held on Saturday, October 14.